This hike offers a lot of "bang for the buck"! Normally it is necessary to substantially penetrate the Wilderness for descent returns. At only about four miles round trip, this is a rare example of close in quality. I would consider it almost on par with the Cave Trail (always a favorite) but less strenuous and much easier to follow. It is so nice in fact, I wondered if it was wise to post it. 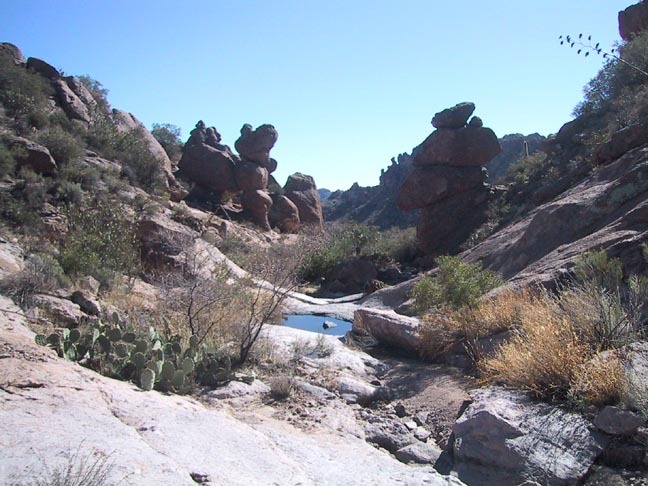 Then, if it is hiked responsibly, I really would like to see other hikers enjoying this beautiful little canyon. 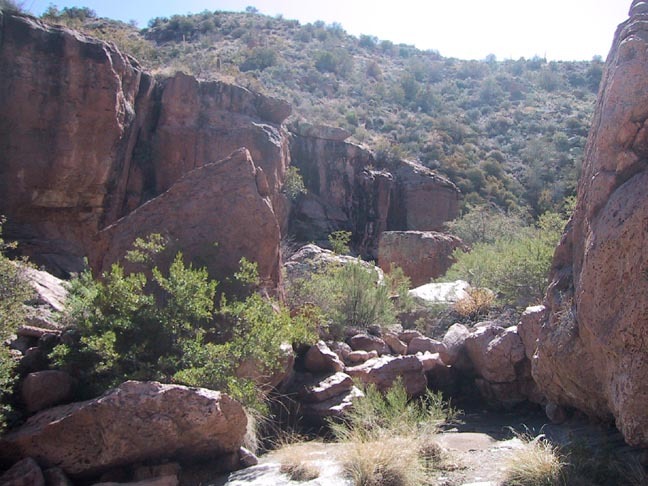 Starting from the Peralta trailhead, take the Bluff Spring trail up "Cardiac Hill", past the Cave Trail intersection to the top, and then down the other side to the bottom where it first crosses the creek bed. 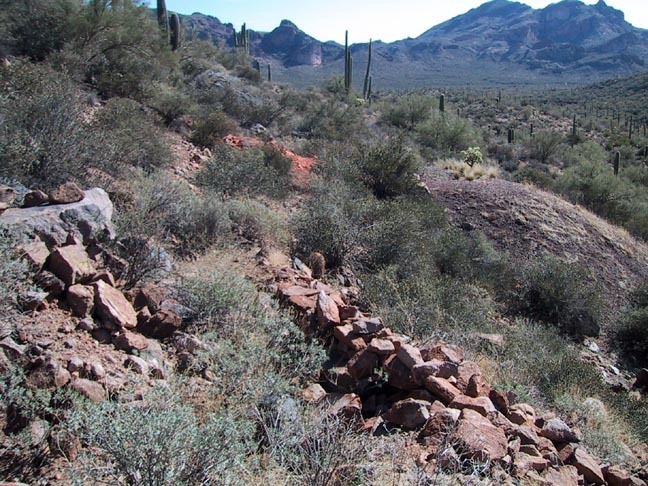 Here you depart the trail and head south through the bottom of the wash following it several miles till you intersect the Dutchman Trail in Barkley Basin which then takes you back to the trailhead. 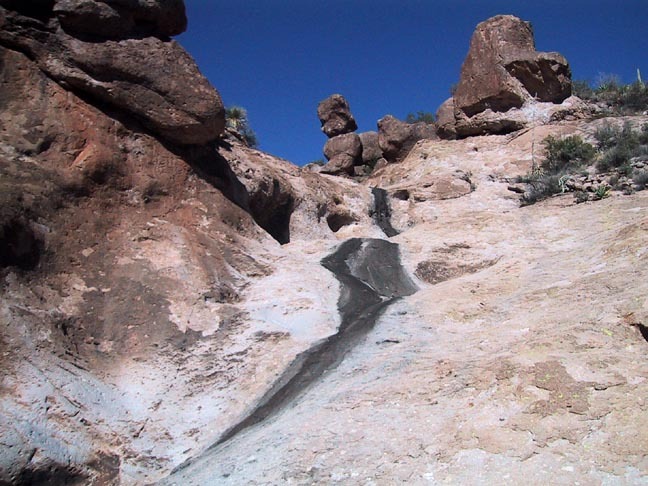 History: "Barks" Canyon is not to be confused with "Barkley" Basin. Barkley Basin, present home of the Quarter Circle U Ranch has been the continuous headquarters of ranching operations for well over a century. Jim Bark, after whom the canyon is named, bought the ranch in 1891, the same year that the "Dutchman" Jacob Waltz died. 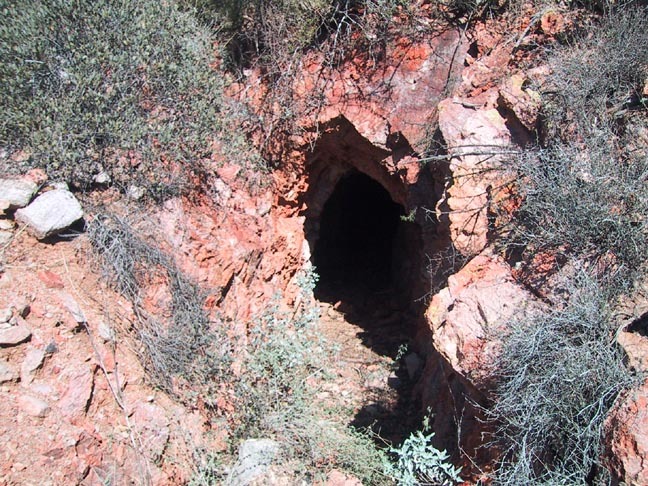 It is he who has been attributed with coining the phrase "Lost Dutchman's Gold Mine" around 1893. With his well-known partner Sims Ely, he was an active "Dutch hunter" for many years. 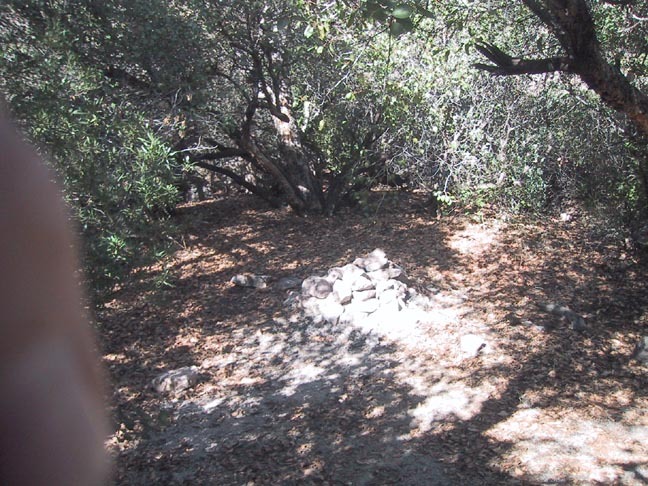 He claims to have actually met Julia Thomas and Rheinhart Petrasch camping near an old well on his ranch. It was they who cared for Waltz until his death, claimed to have directions to the mine, stumbled unprepared into the mountains in mid summer, and thus inaugurated the famous search that still lasts today. William "Tex" Barkley then came along and acquired the ranch in 1907, gave it the "Quarter Circle U" name that still stands today and eventually also acquired First Water Ranch just to the north where his son Bill lived. It was then sold it in 1955 and it was during those final years that author and historian Tom Kollenberg worked for Tex on the ranch. Although Barkley had more than passing interest in the search for the lost mine and welcomed many a Dutch hunter through his ranch over the years, he was probably best known as a prominent figure in the many Sheriff's posses and search parties heading into the Superstitions over the years. Hike: This is the simple part. 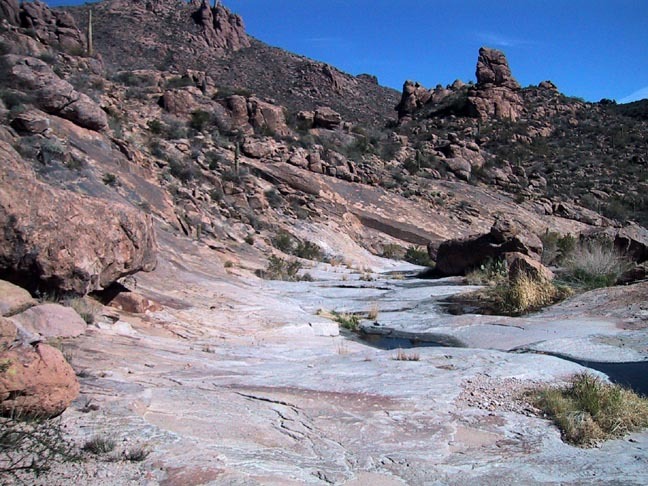 From the point just over a mile in, where Bluff Spring trail crosses the wash at the bottom of Barks Canyon it is simply a matter of following the creek bed all the way south to the Dutchman trail. I saw no cairns or footprints through the numerous sandy areas testifying to the unexpected solitude of this of this seldom used canyon. 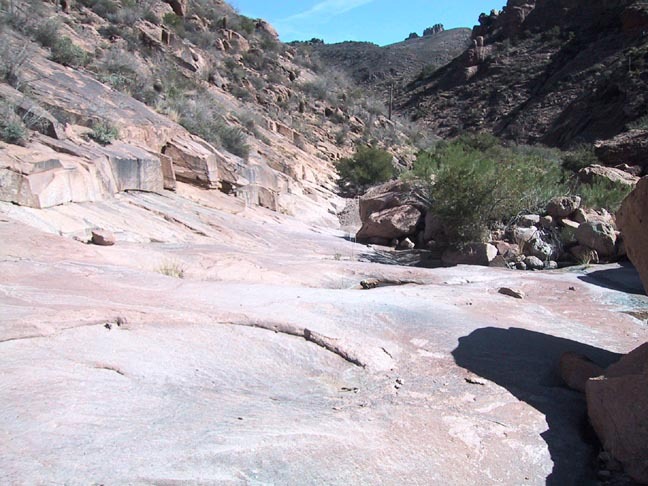 The wash is easy to follow with only minor rock hopping and only one small spot of thick bush. Route finding is a cinch as the canyon presents only a singular route. However, with various paths to choose from through the bottom, I suggest varying from side to side to follow the more interesting terrain features as you go along. The sides are alternately lined with small cliffs and numerous smooth rock areas seeming to grow more and more interesting as you proceed. 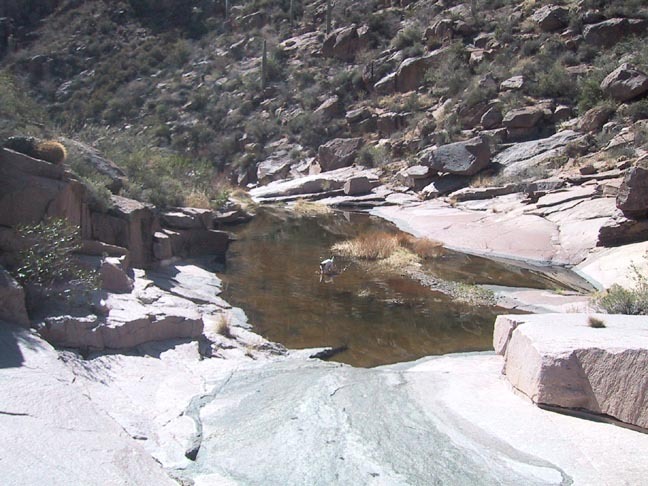 Despite the extremely dry conditions present at the time, there were numerous large pools of water along the way. As you approach the 2.5mi point where the basin starts coming into view, look ahead for reddish colored mine tailings spilling forth about 100 yards up the slope on your left. It cannot be seen from directly beneath so you need to spot it as you are approaching from up stream. This tunnel is shown on Tom Kollenborn's map in Helen Corbin's book "The Curse of the Dutchman's Gold" as being Charles Crawford's camp. No date is given and I don't know if this was a producing mine or merely a prospect. It does go back for a long distance into the mountain possibly indicating a "mine", on the other hand, it is in a very straight line, and that would indicate a "prospect". It does however finally fork at point where the bats were getting thick and I lost the courage to proceed. This may indicate the start of a "drift", or the point at which they possibly began to follow a vein of whatever ore they were seeking. It never ceases to amaze me the amount back breaking work that must have been involved in those hellish conditions to move that much solid rock by hand. Soon after passing the mine, the canyon begins to open up into the Barkley Basin. Continue to follow the widening wash a short distance to the well-worn and easily spotted crossing of the Dutchman trail. From there it is a short one mile cruise back to the trailhead. An option for the diehard who may want a bit more strenuous hike would be to add what I'll call the "Mid Barks" section. To do this, initially remain on Bluff Spring trail going north until you reach the Terrapin trail intersection. 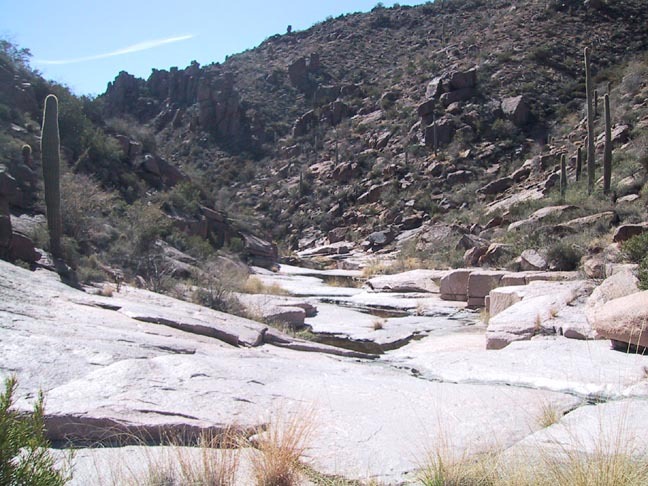 It is here that you now follow the same creek bed south but add on about 1.5 miles extra total distance and a bit more rugged terrain. 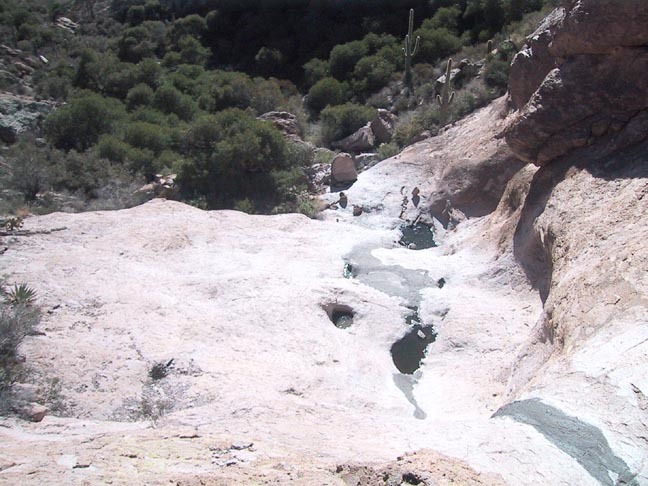 The best part is shortly downstream of the intersection where you will encounter a lengthy and steep series of cascading pools carved into the smooth rock beneath sheer walls. You then enter a beautiful, but dense thicket of trees at the bottom that requires a bit of determination to penetrate. From here you basically parallel Bluff Spring trail and eventually merge onto it as you approach the previously described starting point. As I mentioned at the outset, I sometimes agonize over whether to publicly post some material given the virgin or delicate nature of a certain area. I realize there are good arguments both ways. I have listened to many and I'm still listening. Anyone reading this description should feel welcome to voice their opinion on this matter below as a "Triplog", or directly on the "HAZ Forum".